The UASA issued a study on pricing shares of new companies when listing and companies’ delisting, The working committee entrusted with preparing the study consists of five members representing Oman Capital Markets Authority, Kuwait Capital Markets Authority and the Egyptian Financial Regulatory Authority in cooperation with the UASA General Secretariat and a number of specialized departments from the UASA members. The study was based on the survey circulated among the UASA Members to identify their experiences in pricing shares of new companies when listing and companies’ delisting. The study included three main sections. The first one reviewed a number of international experiences in pricing shares of new companies when listing and companies’ delisting and their requirements in these markets. 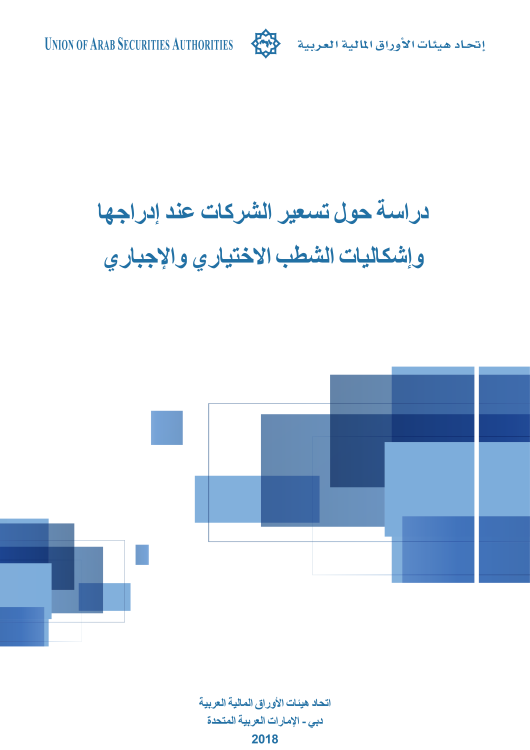 The second section of the study reviewed the issue of pricing companies’ shares upon listing in the Arab Stock markets. The third section discussed the legislative and regulatory framework of companies’ delisting, the measures taken by the regulators to protect the shareholders' rights after the companies’ delisting, and discussed also the compulsory delisting of companies. As well as a number of recommendations related to pricing shares of new companies when listing and issues related to voluntary and compulsory companies’ delisting.